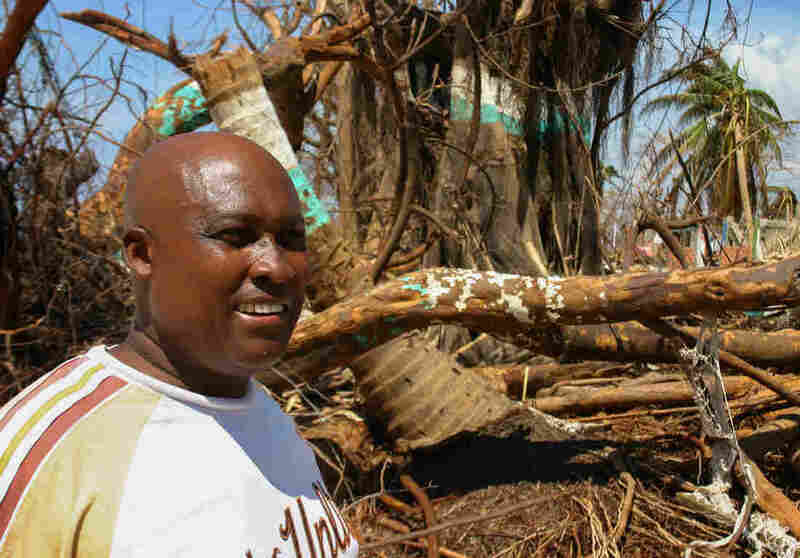 Haitians Weather Hurricane: 'If We're Going To Die, We're Going To Die Here' : Goats and Soda Hundreds of people were killed in Haiti after Hurricane Matthew ravaged the southwest part of the country. Survivors explain why they refused to evacuate. 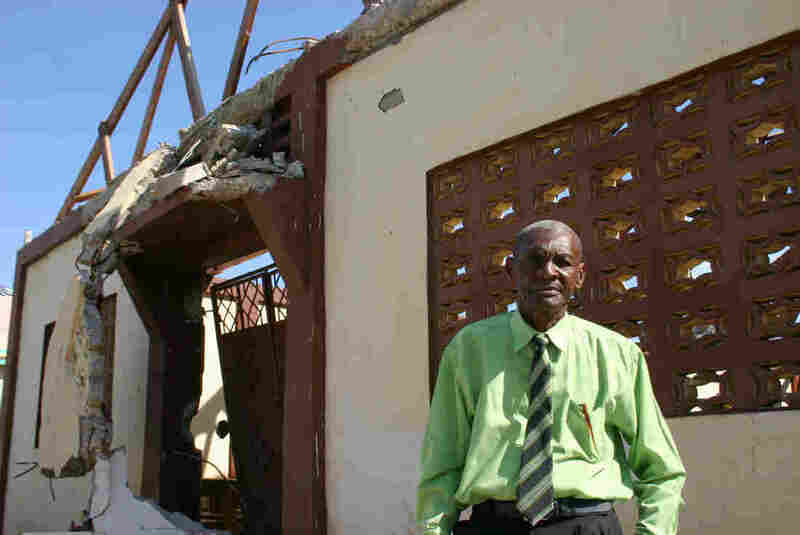 Church leader Nerjuste Louis Sony stands in front of his church, left roofless by the hurricane. In Port Salut, the individual signs of the Hurricane Matthew's destruction are everywhere. A giant mango tree with its thick trunk snapped like a wishbone. A cinder block house crumpled on its foundation. But it's only as you continue to drive through this part of the coast that you see the extent of the damage. The devastation goes on and on. Hillsides are swept clean of trees. Neighborhood after neighborhood is in ruin. On the first Sunday after the storm, parishioners gathered inside the roofless Mission Evangelical Baptist Church in Port Salut for Mass. Hurricane Matthew's 145 mph winds peeled the metal sheets from the rafters of the church and caused part of the front of the building to collapse. Haiti's Storm Refugees Want To Know: What's The Plan? "I'm 64 years old. I've been a pastor for 41 years," says the church leader Nerjuste Louis Sony. He rode out the storm in his small cinder block house behind the church. "All my life and all my ministry life, I've never seen such a devastating storm." When the earthquake devastated much of Haiti in 2010, this part of the country was far enough away from the epicenter that it wasn't damaged. But there was no such luck this time. 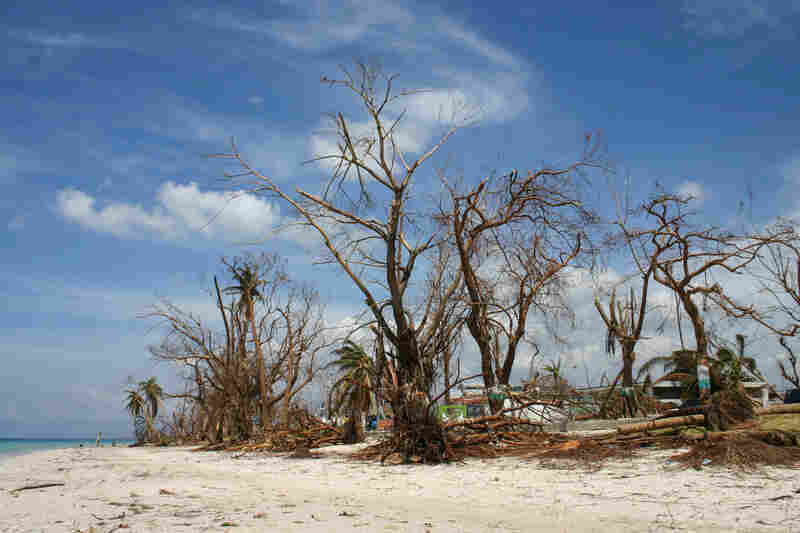 Most of Port Salut's buildings are now either destroyed, damaged or disappeared. The beach in front of Nicholas Buisson's house in Port Salut. Nicholas Buisson's low-slung, white concrete house is the only one left standing along one section of the beach. "It was pretty amazing, pretty amazing," Buisson says of the storm. "There was a lot of wind, a lot of water." He says the most powerful winds started around midnight and the small shacks around him started to explode. "Sheet metal was just flying. You see them back there?" he asks, pointing to shredded sheets of corrugated metal stuck up against a fence. The metal sheets "were flying, hitting the house. They were like missiles. Flying missiles." Buisson was born and raised in Haiti, but spent most of his adult life in the U.S. In 2013 he came back to Port Salut to live with his two brothers in a house they bought by the ocean. When they heard Hurricane Matthew was coming, they decided not to evacuate. "Basically we were the only ones that stayed here in the house," he says. "Most everybody left. But us, we said, 'We're not leaving here. If we're going to die, we're going to die here. Because this is our place.' "
Now their yard is clogged with downed trees and debris flung in by the crashing surf. Nicholas Buisson stands next to his tattered hammock on the beach in front of his house in Port Salut. Buisson's brother is trying to repair an aging RV. Now it sits up against the front of the house, shoved there by the storm. An American flag still flies from the roof of the vehicle. Buisson spent 34 years in the U.S., but he says Haiti was always home. "I want to stay here. I would like to stay until I die. Because this is the place I was born. This is the place that I love. This is my house," he says. And not even the powerful winds of Hurricane Matthew that killed many of his neighbors were going to drive him out of it.